I subconsciously donned a white blouse for our photo shoot of white teas paired with cheeses at the French Cheese Board in SoHo. When my collaborators arrived, I noticed that one also wore a white top while the other had styled her outfit with a gorgeous tea leaf necklace. Jee of Oh, How Civilized was the mastermind behind this pairing indulgence and Sara of Tea Happiness secured the venue. 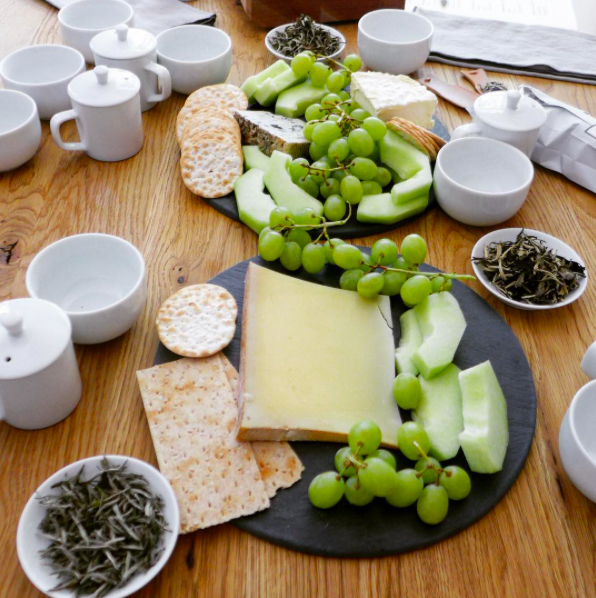 Before I detail the pairing event, I would like to thank the French Cheese Board for the space and the delicious cheeses as well as In Pursuit of Tea, Royal Tea New York, and Silver Needle Tea Co. for the teas. You all made this educational, flavorful, and fun experience possible. Jee, Sara, and I are enrolled in a tea sommelier course with the International Tea Education Institute. In addition to learning about the history of tea history, cultivation, and preparation we've also been introduced to pairing teas with food. Tea Pairing 101 is our approach to practicing and reinforcing our formal tea education. The tea and cheese pairing was a multi-step process beginning with selecting three cheeses to pair with our three teas. The teas we had to pair were Silver Needle courtesy of Silver Needle Tea Co., Nepal White courtesy of Royal Tea NY, and Midnight White courtesy of In Pursuit of Tea. We drank the teas in the order just presented. The cheeses we chose were Beaufort, Brillat-Savarin, and Blue de Chèvre. After choosing the cheeses, we set the table. With her keen aesthetic sensibility, Jee was the artistic director. After setting the table we photographed it, then infused each tea using professional tasting cups, and then tasted each tea with each of the three cheeses. Each of took turns infusing and pouring the teas. Three grams* of each tea were steeped in a four-ounce capacity professional cupping set using 185F - 195F degree water for three minutes. Each tea was formally assessed on its own and again paired with each cheese. Silver Needle - Silver Needle Tea Co.
*In the first sessions with Nepal White and Midnight White we used two grams on my suggestion. The liquors was better for using three grams! The following characteristics of each cheese were provided by the French Cheese Board. Jee and Sara preferred the Midnight White + Blue de Chèvre. I wasn't opposed to this pairing; it certainly wasn't as contrarian as the Silver Needle + Blue de Chèvre. The Beaufort is a versatile cheese and paired with all three French cheeses we selected but especially with the Silver Needle and Nepal White. The broad flavor profile of the Beaufort complemented the dominant notes in the each of the teas. If you prefer a softer cheese, then the Brillat-Savarin is a strong candidate. This creamy cheese would also pair well with a Japanese green tea. The Blue de Chèvre, while lovely on its own, overwhelmed these white teas. The pairing with the Silver Needle was antagonistic. I did not detect moldy notes in the Blue de Chèvre, rather, it was saltier than the other two cheeses. I wouldn't mind pairing it with oceanic Japanese green teas or a shou puer. A straight goat cheese, either soft or firm, might have paired better with the white teas. We plan to develop a pairing for each tea type; with white tea accomplished we turn our focus to green tea. Watch this space! P.S. Are you interested in taking a tea course with the International Tea Education Institute? Check out all the ITEI courses and use the NOTESONTEA10 discount code when you register. Brilliant! I love how the teas were assessed on their own and how the French Cheese Board had provided you with every cheese characteristics. I'm guessing you guys had a bite of each cheese also on its own and then a second bite this time with the tea. This whole white tea & cheese pairing experience is extremely well documented with wonderful images. It's fun and it just makes the reader want to duplicate what you did. Well Done! Hello Sylvana. Thank you for your kind words. I hope that all readers of our posts will feel as you do and want to replicate the pairings or experiment with their own. Hello Georgia -- finally posted a discussion of the chemistry of your white tea and cheese pairing on my blog. You can find the link to it on facebook.com/pairteas. Such a great experience to read your blog—love it all, not just the tea-pairing parts! Fascinating post, I was just listening to a wine & cheese podcast on the way home today so I was so excited to read this! I love cheese but don't know much about it, I just pick up random cheeses at Murray's and have been trying to learn about them more. I will try pairing some similar cheeses with the white teas you suggested.